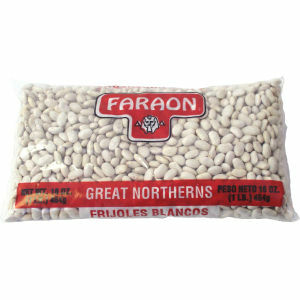 Faraon Great Northern Beans are packed using product harvested from the very best fertile areas. These elongated white treasures have gone through a process where only the very best goes inside the bag. Enjoy as a vegetarian dish, as a pure authentic Spanish "fabada" or any way that you can think of by adding your favorite ingredients. Cooking suggestions are in the back of our package for ease in getting you started. Enjoy.